Hide My IP cannot be trusted- do not buy it When you subscribe with the premium annual subscription they begin degrading your access by month 2, then totally convert it to standard by months 3-4. At first we thought this was just a glitch, but after subscribing for the second time (Yes! We were naive enough to trust them again), the access limitation and account conversion to standard has happened again. While their product is good their practice is terrible. No stars for these thugs. Valet mellan dessa två är svårt. Båda erbjuder hög hastighet, men Hide My IP är lite bättre för streamingtjänster som Netflix. Hotspot är en av de bästa på att gömma data, men Hide My IP har stöd för regioner såsom Sydasien, Mellanöstern och Afrika. 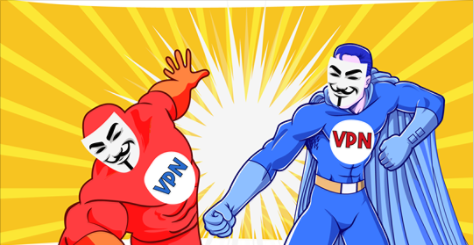 Vi kan säga att vinnaren är Hotspot Shield, då de skyddar data bättre och fungerar därmed som en mer praktisk VPN. Däremot är Hide My IP fortfarande ett bra alternativ. When you subscribe with the premium annual subscription they begin degrading your access by month 2, then totally convert it to standard by months 3-4. At first we thought this was just a glitch, but after subscribing for the second time (Yes! We were naive enough to trust them again), the access limitation and account conversion to standard has happened again. While their product is good their practice is terrible. No stars for these thugs.